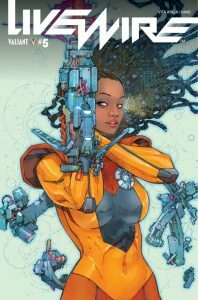 Livewire (Amanda McKee), a trained psiot, is wanted for acts of terrorism. Now, she has stumbled upon OMEN’S facility for teaching young psiots to control and develop their powers. A training camp! But of course, every new discovery for Livewire leads to physical confrontations! Let’s start with the front cover to issue 5. 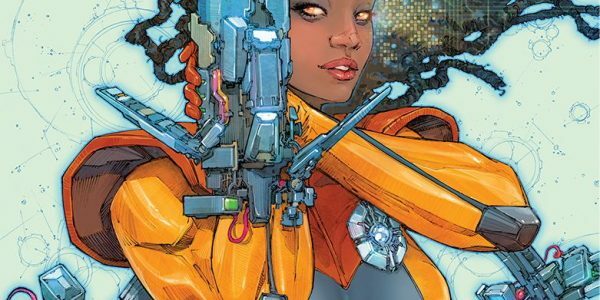 It’s an eye catcher, illustrated by Kenneth Rocafort. The issue, showing the training and simultaneous search for Phoebe Daniels, may leave a few of us scratching our heads. I think a comic should never confuse a new reader or constant reader. That’s on the writer, (Vita Ayala), artist (Kano) and editor (Heather Antos). But never mind, there is clearly a conflict building, with lots of great action, acrobatics, and visual drama. It’s Livewire to the rescue, live and televised! And that’s what we’re here for!